A long time coming, here is the tenth episode of the Scientific Quilter podcast. I basically had to relearn some of Biology 101 to get this information, but the end result(s) are a cool and different quilt design. This is the Darla version of DNA. Because I have a very basic understanding, this will be a very basic primer for a unique end result. This is still very “sciency”, so for the artsy types, scroll down to the middle to bottom of the post for the DNA design. Every living thing has in their cells the instructions, the blueprint of life. This is the DNA or deoxyribonucleic acid found in our cell nucleus. We hear about DNA on Court TV shows, crime scene shows, movies, books, your auntie June. It’s hard to escape hearing about DNA. DNA is made of a series of bases in a specific order. Cells use DNA to create amino acids which in turn create proteins, which in turn create cells, which in turn create body parts (skipping a lot of steps and details here). The DNA is double helix shaped, which is a “twisted ladder” shape. Each rung of the ladder is made of a series of two bases bonded together. DNA has four bases called: Adenine, Thymine, Cytosine, Guanine, which we shorten to A, T, C, G. A always binds to T, C always binds to G.
The way that these bases sit on each rung of the ladder determine the order they will code for proteins. The DNA will split apart when it is time to use the DNA for coding. 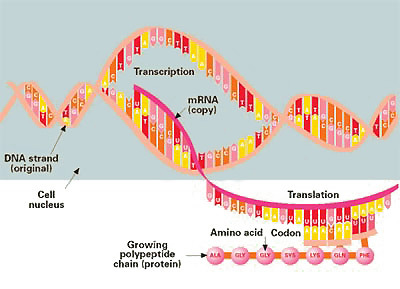 Each rung of the ladder is available to bind to other bases called RNA. The Thymine base is not found in RNA, but Uracil (known as U) takes its place. An Adenine base will bond with a Uracil base on the RNA, otherwise the bases will bond the same as they do on the DNA ladder rings. As you can see from the website diagram from Munich RE, the DNA strand gets opened up, then copied, then coded to what they call codons. Codons are groups of three bases. Then each codon codes for a specific amino acid. The amino acids are linked together to form protein chains. There are 20 amino acids and a sequence that starts a protein chain and a couple of sequences that stop a protein chain. There are more than 20 combinations of three letters in series (believe it or not) and so several DNA sequences code for the same amino acid. I could provide a boring table with all the information about the amino acids (yawn), or I could show you what I found on Munich RE website! 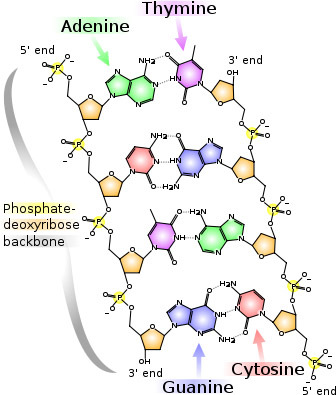 The image below shows a pictorial way that you can find out which amino acids are created from three bases in order. The image works like this. The innermost circle is the first base of the sequence, the second ring is the second base in the sequence, and the third ring is the third base in the sequence, with the names of the amino acids vertically coming out of the diagram. As you can see starting with A on the diagram, then going to U, then G, you see the word START. When this code is found in the DNA the protein knows “hey I need to start making amino acids now”. Then the next three bases make the next amino acid, and so on, then eventually there is found a stop amino acid and the protein know to stop coding. Wikipedia has several DNA-related articles about DNA the Genetic Code, and Amino Acids. So Beverly shows the diversity of the DNA sequence in a quilt. 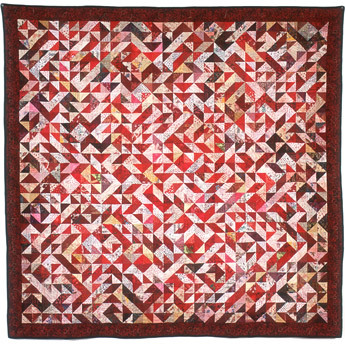 Beverly uses a dark and light contrast to determine the bases represented in the quilt. For her code, the different corners of dark fabric represent the different bases in the sequence. Since the genes that Beverly works on are 600 – 900 bases in length this could become a crazy long process to obtain the quilt. Completeing half square triangles like these would be an easy task that could be completed while working on other projects if you use leaders and enders. Leaders and Enders from Bonnie Hunter of Quiltville is a technique where you work on one project before and after other projects. For such a long and simple piecing process, leaders and enders would help break up the monotony of half square triangles while working on piecing for another quilt. I learned about this technique from one of the ladies I have been starting to sew with and it looks like it works great – even though I haven’t been doing any piecing recently to test it out. The genetic design comes after the triangles are pieced and so one would only pay attention to light and dark sides when piecing, and how many pieces of each color. On LabMom’s site, she highlighted the Genome Quilt and did an excellent job in explaining the quilting site. How do you find your DNA? Human DNA is very similar to each other. We are over 99% conserved which means that a DNA sequence for one human will be very, very similar to the DNA sequence for another human. Since we have completed the human genome, there are public websites that hold the code for an entire human on the site. There are complicated websites such as GenBank from NCBI (given to me by an old classmate of mine) and Ensembl (given to me by LabMom). With luck I was able to find part of a mouse gene on the GenBank site. But I could not tell you how or where I accomplished this. A second attempt to find another gene had me running in circles. I finally found another gene for Oryza sativa Japonica Group, but the I went so many places to get there I STILL don’t know what actually took me there. With LabMom’s help, I was able to find a DNA sequence (because she pointed me right to it) on the Ensembl site. This is for the Estrogen Receptor. If it doesn’t show up in the link, click sequence on the left side. Only the letters in red are actually coded. The rest is just “filler DNA”. DNA that just takes up space. If you’re willing to pay National Geographic and be a part of a larger project, you can order a kit (runs about 100 dollars) and you just send off a cheek swab. They’ll analyze your DNA (mitochondrial for the ladies and y chromosome for the gentlemen). Beverly St Clair says that the folks at National Geographic will provide you with a sequence and show how your sequence differs from the reference sequence and this is how Beverly obtains her DNA samples currently. If you want to go with other organisms besides humans and mice, here is a quilt from the hepatitis C gene that Beverly St Clair did. You can see that with Beverly’s process color is part of the design. Beverly said that the Hepititus C quilt was for a nephew who was sequencing the Hepatitis C gene, so that is where she obtained the DNA sequence for that. This whole thing is so Madame Defarge. Which is what makes it interesting to me. Here’s where I was thinking about the next step. What else could you do with a quilt? I completely respect and appreciate the work and time done already by Beverly St Clair. But the Scientific Quilter likes to think about what else could be done. There was a very good article in the American Quilter magazine March 2010 issue. This magazine has an article that highlights Beverly St Clair, Marjorie Taylor who quilts brain scans, Karylee Doubiago who quilts with x-rays, and Maris Azevedo who quilted her CT scan of lung tissue. There is not any more description in this magazine about the DNA quilt than these medical quilts. It also didn’t say more than Beverly’s own website. Being fairly squeamish, other than the DNA quilt, which is more academic and theoretical than the others, I will probably stick with the DNA idea over the other medically based quilts. If I went that one step further, from just DNA to Codons to Amino Acids, how would I do it? This was a direct response to the Munich RE image I saw earlier. Even though there is a lot of customization on bubbl, I got started on my amino acid bubble and decided its best left to just use the Munich RE site image above. I couldn’t let that image sit all crooked and uneven like that. I’m a quilter, for goodness sake. Also this quilt idea would not code anything, but would provide the code for what I wanted to do next. However the bubbl website would be good for a flow chart of a genetic trait! (another quilty idea). Fusible web or applique would be the way to go with bias bars traveling from one idea from another. In bubbl, you can chose to sign in and save your designs or just export them as is. Then I was thinking about the codon/amino acid idea. You could designate colors for each DNA or RNA base. And then you could create boxes (my original idea was flying geese, but this idea seems to have better continuity to it). The boxes are broken up into three sections, one for each DNA base of the codon. Here is the completed design. There are several key things about this design. There are lighter sections and darker sections. The lighter sections represent a protien that is coded for. The first lighter block starts with AUG at the top and the last lighter block ends with UGA. 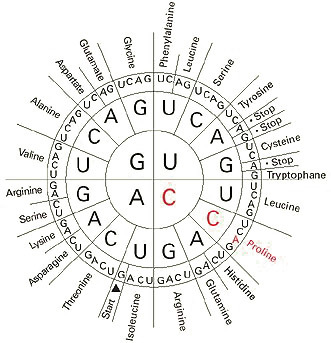 Starts with the start codon and ends with one of the stop codons. The darker sections are the filler design. There is no start codon until the lighter section of the quilt. You could sash with dark or light fabrics. Each box actually has 6 sections, which would be good quilt as you go sections. The top three sections are the RNA side – the amino acid side which is actually the end result. The top of the box codes with Uracil not Thymine. The bottom half of each box is the DNA side, the original code which produced the RNA side. The bottom of the box codes with Thymine, not Uracil. Just how did I arrive at the final quilt? Warning: I now believe that the following process does not have the correct translation (or maybe it’s transcription step). So I left out a step here. But I did get to a coded result anyway. Before I arrived at the diagram I had to do a little science and reasoning. But T bonds with A, C bonds with G, and U replaces T in the final product. So for the RNA these letters need to be switched around. I’ll replace T with A and C with G, G with C, and A with U.
I found it helps to first replace these to a different letter such as X or Y when doing replace all in microsoft word. I see two start codons and an end codon. The code in between is “filler DNA”. There is more to the sequence but this is all I’m doing today folks. Reading the graph from Munich RE shows me exactly which amino acids are coded for. You could quilt this information in each box. So what if I made a mistake? Then as LabDad said to LabMom in her post, it’s like you introduced a mutation. Genius! Which I think is the Estrogen Recptor that LabMom sent me in an e-mail. Thanks for your help LabMom. Where is the Gel Electrophoresis Quilt idea? Warning #2: This section may contain some errors due to a mix-up of understanding on protein gel electrophoresis and DNA gel electrophoresis. I never took BioChem and I am thinking it shows by my confusion here. If you would like to explain the difference to me, please feel free to send me a (nice) e-mail. End of Warning. Gel Electrophoresis is a technique where you take proteins, cut them up into sections, make them charged (usually negatively), and then electrify them in this gel. The electric charge pulls the large nonpolar molecules slowly across the gel, and pulls the small polar charged molecules quickly across the gel. Usually in the crime scene analysis Gel electrophoresis is a way to compare with a reference sample. Say there is some crime scene DNA and you have suspect DNA and you run them both parallel in the gel electrophoresis plates at the same time. Then you stain the gel to see it and hold it under blacklight. If the suspect DNA is broken up in similar patterns to the crime scene DNA then there is a higher chance that the suspect was at the crime scene. Or you can see the types of proteins in a sample this way. This would be a good quilt design as well. I have already designed a quilt that looks very similar to this – the Spectra Quilt idea. Since I don’t have any proteins to analyze, I would refer back to the website that shows your blog website as DNA for inspiration on this. If I would quilt any gel electrophoresis style of quilt, I would quilt this as my quilt. Again I would use bias bars for the lines. The idea of gel electrophoresis is very similar to color chromatography. The idea of moving some particles faster than others, spreading particles out so you can see the differences. I found a nice website that shows how to make your own gel electrophoresis box and separate colors the same way as color chromotography. The New York Times posted this article, and I think you could translate this DNA research into quilting too, but I’m not attempting it. Code Organ This synthesizes your website into music based on what you write about. Customized Graph Paper A great tool for drawing your own quilt designs. Check out my Quiltversary post, and my adding audio to podcast post. And thanks to Munich RE and Beverly St Clair for letting me use their images on my site. Thanks so much Reeze for stopping by – so quickly after I posted! When is the next sewing day by the way? Aren’t these genome quilts amazing! I have one in planning myself (http://mymessings.blogspot.com/search/label/genome%20quilt) i intend to use (part of) the sequence of the gene that i’m currently doing research on. One tiny correction to your information above – you mention cutting up proteins and running them on a gel – while you can run proteins on a gel, in the context of what you’re talking about you’re running DNA on the gel, not proteins. (the two require different types of gels and different visualisation techniques). Hey Rachel, your genome quilt looks amazing. It looks like that is in progress? Are you still in the planning stages or are all those squares actually cut up and sewn together? Do you use Electric quilt to get the fabrics scanned in for the quilt design? Thanks for the information correction. I remember doing something with protiens of ragweed but it was a project that I never finished. I guess I didn’t realize there were two different gel types. As you can see, I really haven’t studied this in depth. I think the two types of gel I got mixed up. I am hoping that’s about all I mixed up! If so, not all that bad for a physics girl. Unless you count the mistake I already caught myself. The one about the proteins in the gels was the only mistake i spotted when i read it, other than that i found it a very informative and knowledgeable post (and that’s coming from a medical scientist). My quilt hasn’t been started yet – i’m still in the planning stages. I can’t decide how big to make the blocks so i haven’t even cut into my fabric yet (or pre-washed it for that matter). I made my ‘mock-up’ with pixlr. it’s VERY basic. I didn’t have anything else installed on my computer at the time. I’ve never used elextronic quilt. I should have had your website up while I was listening, but of course that would have been dangerous to do while driving. lol. These quilts are amazing and beuatiful. Thank you Brye for stopping by. I hope you can tell that the quilts done here are Beverly’s but that I threw in my own designs via photoshop. On one hand I can’t wait to get started with fabric for these ideas, on the other hand, I am still wanting to wait for a while. Good luck with your swap! Oh Darla…you were giving me horrible flashbacks to my microbiology class! The quilts are beautful and this was a very interesting topic! Can’t wait for the next one! Horrible flashbacks were not intended. But these ideas are great and simple in design, if not simple in concept. If I could get working on these designs and actually produce the scientific quilts I am designing, this would be a very good thing. I like the look of the quilts. While listening to the podcast I couldn’t quite picture how the quilts would look, but wow they are so colorful and interestng. Are making a West of Baltimore quilt? I would like to make a Baltimore quilt someday through the Simple Arts website. The quilt is just lovely. Thank you. I really should do more to describe the actual quilt in the podcast than just the science behind it. I had this picture in my head for about a month, with a few changes along the way, it was nice to see the design work out. I am glad you appreciate it. My Mimi Dietrich small balimore album quilt is the only one I’ve made so far (which I show a picture of in podcast 2). I do like Annie Smith’s West of Baltimore quilt as well. For now, no plans to complete another baltimore album style quilt. We will see however, that could change! Hello, and thanks for the inspiration. I will try to find one of the tumor suppressor genes (specifically for breast cancer) and make a quilt of it. Two of these genes were mentioned in a class I’m taking, but I can’t quite recall their names. I’ll dig-around on the links you’ve posted. Once again, thanks! I followed the instructions and got myself a “map” of the BRCA-1 breast cancer tumor suppressor gene. That is, I got a whole bunch of “GAAGTGTTT” etc. that I can convert into a quilt design. That’s what I needed like 3 weeks ago when I was trying to figure out how to use the NCBI site. Great job for you and what a wonderful idea for a quilt DNA! Amazing podcast Darla. I see someone above said it brought flashbacks. It did for me too, but good ones! The quilts inspired by DNA are amazing. After my B.Sc. I went into Law School, so have not touched the science in a lot of years. I’m really enjoying this. That’s great Colleen. Glad these were better flashbacks for you! I hope people don’t think that beverly’s quilt designs were my own. What a great idea that she had! Anyway, it’s nice to see you here again Colleen!